Perfect for a saturday night in. Preheat the oven to 200°C, gas mark 6 or the grill to medium. 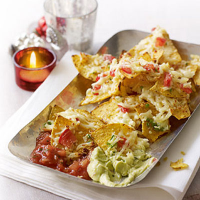 Tip the tortilla chips onto a non-stick baking tray. Add the tomatoes, mozzarella and chillies. Season, then cook or grill for 5–8 minutes until the cheese is bubbling. Transfer onto a sharing plate and serve with the guacamole and tomato salsa.